A sign sits outside of the Habitat ReStore advertising the organizations signature fundraiser. 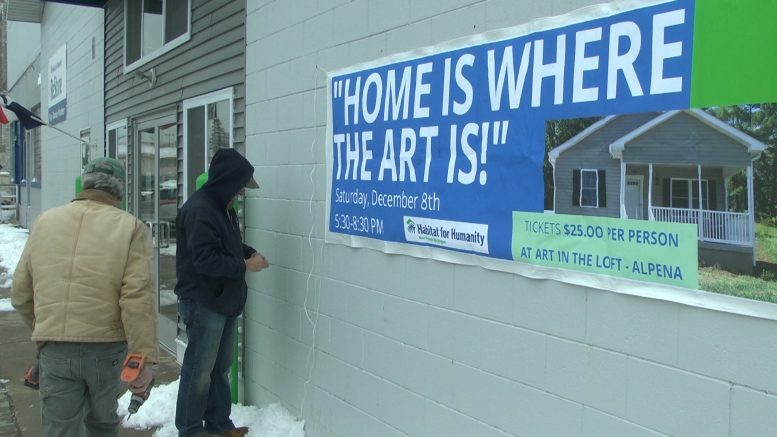 Alpena — Habitat for Humanity of Northeast Michigan helps provide houses for those in need of shelter. The organization depends on contributions from the community to continue carrying out their mission. That’s why they’re gearing up for their annual fundraiser this week. ‘Home is where the art is!’ will take place this Saturday evening at Art in the Loft. The fundraiser will include a night of food, entertainment, and all sorts of auction items for folks to bid on. Money raised will help support the nonprofit’s mission to provide a stable roof over peoples heads all throughout the Sunrise Side. Tickets can be purchased at a number of local locations in Alpena, Alcona, and Presque Isle counties including Alpena Alcona Area Credit Union, Neiman’s Family Market, The Flour Garden and the Dragonfly Art Gallery in Harrisville, and the Habitat ReStore. Tickets are also available at the door for purchase the night of the event. The fundraiser kicks off at 5:30 p.m. Plenty of great art and items are up for grabs. For more information, visit the Habitat for Humanity website.